Control 2 circuits at once using this DPDT Rocker Switch. Each of the 2 circuits can select between 2 options. 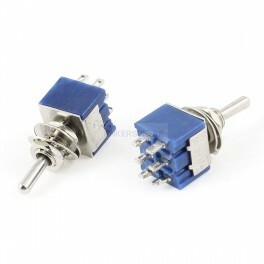 This DPDT Toggle Switch with Mounting Washer and Nut is perfect for an ON/OFF switch to control 2 things at once. It has 2 sets of 3 Poles and is Double Pole Double Throw (DPDT) which means that when you slide the switch to the up position, the top and middle poles get connected, and when you slide the switch to the down position, the bottom and middle poles get connected. Very convenient in circuits because you can not only use it as an ON/OFF switch by connecting the middle and the top or the middle and the bottom poles to your circuit, but also as a toggle switch connecting the middle pole to the top and the middle pole to the bottom when you press it into the up and down positions respectively. Useful for having a single ON/OFF switch control 2 things at once such as a circuit and an indicator light.